Pyramid 2650 Auto Aligning Time Clock monitors employee arrivals, breaks, lunches, overtime and departures with 6-column time cards. 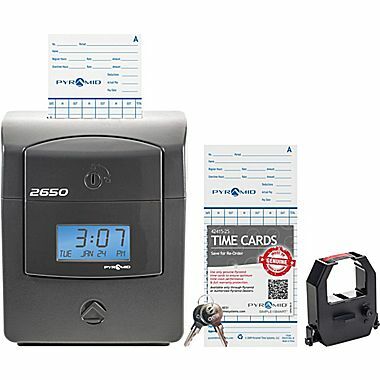 Pyramid 2650 Auto Aligning Time Clock provides detailed time and attendance recording with 6 column time card for arrival times, breaks, lunches, overtime or departure times. No employee limit for ultimate flexibility. Automatic top loading time card keeps daily punches neatly aligned. Dual color ribbon highlights early or late punch times in red ink. Internal buzzer notifies employees of start times, breaks, lunches, shift changes and dismissal times. Compact design makes this time clock ideal for small business. Pyramid 2650 is simple to set up and easy to use. Tracks employee arrival times, breaks, lunches, overtime or departure times for weekly, bi-weekly, semi-monthly or monthly pay periods. 6-Column, 2-sided time card accommodates 3 In and Out punch intervals per day. Highlights early and late punches in red ink. Displays and prints time in regular (AM/PM), military or military hundredths. English, Spanish or French programming menu. Internal buzzer alerts workers of start times, breaks, lunches, shift changes and dismissal times. Auto or manual shift option prevents over-printing on time card. Pyramid 2650 Auto Aligning, 6-Column Time Clock, 25 complimentary time cards, ribbon cartridge, user guide.